For the money, this guitar is a definite keeper, and one that could easily become your trademark guitar. The Bigsby B50 is a great addition. 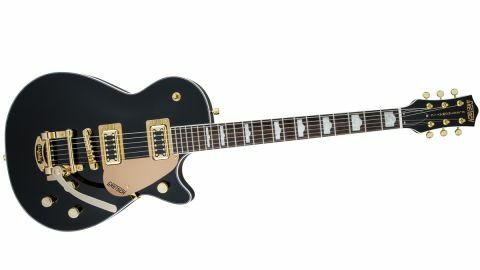 Since partnering with Fender in 2002, Gretsch has enjoyed a second golden era, and its current range balances tributes to classic models with some new twists on the form, such as this limited edition Pro Jet from the mid-priced Electromatic range. Right from the off, this Pro Jet pushes all the right visual buttons; the jet-black paint job is finished to a standard that embarrasses some premium American-built guitars, and combined with gold hardware, the end result is pure eye-candy that invokes the character of the ultra-rare Penguin - a single-cut custom limited to just a few dozen examples made back in the late 1950s. The Pro Jet sports a pair of Blacktop Filter’Tron humbuckers with a simple control layout, consisting of a three-way selector switch with separate volume knobs and master tone below the bridge, with a master volume knob on the cutaway bout. The other hard-to-miss hardware is the licensed Bigsby B50 vibrato, which is beautifully made and adds plenty of vintage mojo. The Pro Jet’s ‘out of the box’ fit and finish are excellent, with no sharp fret ends, and truss rod and intonation set correctly for the standard issue 0.09 to 0.046 strings. Plugged in, the Pro Jet definitely has that ‘Gretsch sound’, more focused and forward in the upper mids, with a balanced treble and tight bass that can sound like a P-90 but with all the benefits of a humbucker - edgy and aggressive in the bridge, warm and jazzy in the neck. The Blacktop Filter’Trons are a newer design with ceramic magnets - similar to those found on some 70s guitars – with all the dynamic punch Gretsch is known for, but with a hotter output. The Pro Jet’s build emphasises this punch - the chambered basswood body is topped with an arched maple cap, and a slim ‘D’ profile maple neck with medium jumbo frets. It all adds up to lots of acoustic resonance mixed with slick playability. Using both pickups together and varying the separate volumes adds subtle nuance, which is easy to control with the master volume. The B50 is quite stable as long as you don’t go crazy - adding shimmer to big reverb’d chords is its jam. Overall, this limited edition Pro Jet is a real player’s guitar - its distinctive tone is solidly anchored in 1950s Americana, giving an authentic performance for country, rockabilly, jazz and more.